Earlier this week, the Prem Watsa-led Fairfax group announced that it was making a $4.7 billion bid to take Blackberry private. This followed Blackberry's preannouncement of disastrous Q2 results that showed smartphone shipments crashing to 3.7 million unit and total revenue collapsing to $1.6 billion. The company also took an inventory charge of roughly $1 billion because of unsold Blackberry 10 devices. However, since the funding for the deal has not yet been secured, it may also have been a preannouncement to halt the company's stock decline. The company announced that 50% of its $1.6 billion revenue was from the services segment (roughly flat QoQ). If we assume flat revenue from the software/other segment, it leaves us with just $720 million in hardware revenue. 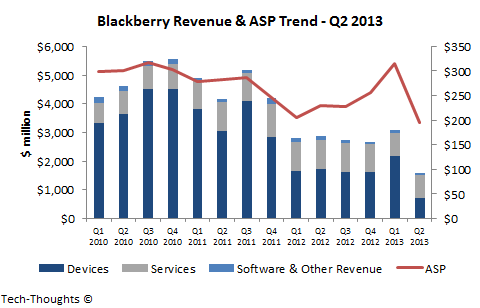 This implies that Blackberry's ASP fell by 38% sequentially to just $195. This ASP crash, combined with the large inventory write-off suggests that demand for BB10 devices is virtually non-existent. In the face of these challenges, the company announced that it was cutting 4500 jobs (40% of the company's workforce) and is targeting a 50% reduction in operating expenditures. To Asian hardware vendors, Blackberry's primary attraction as an acquisition target was the quality of its relationships with carriers and enterprises. These results have shown that those relationships no longer carry the same value. In addition to this, shutting down hardware unit after an acquisition is likely to cost billions more. 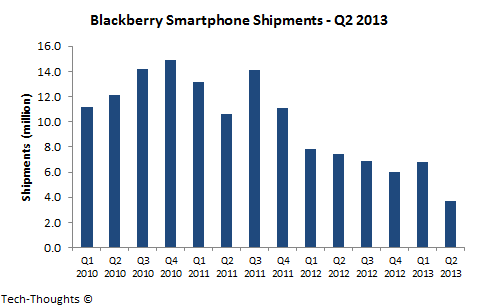 Therefore, Blackberry's hardware unit was considered worthless. This brings in Fairfax's $4.7 billion offer (roughly ~$2 billion excluding cash). Watsa is one of Blackberry's largest shareholders and it may have been his goal to halt the stock decline and either take the company private or generate interest from competing bidders. However, given Blackberry's position, the likelihood of deal financing or competing aren't incredibly high. Blackberry investors may not be out of the woods just yet.